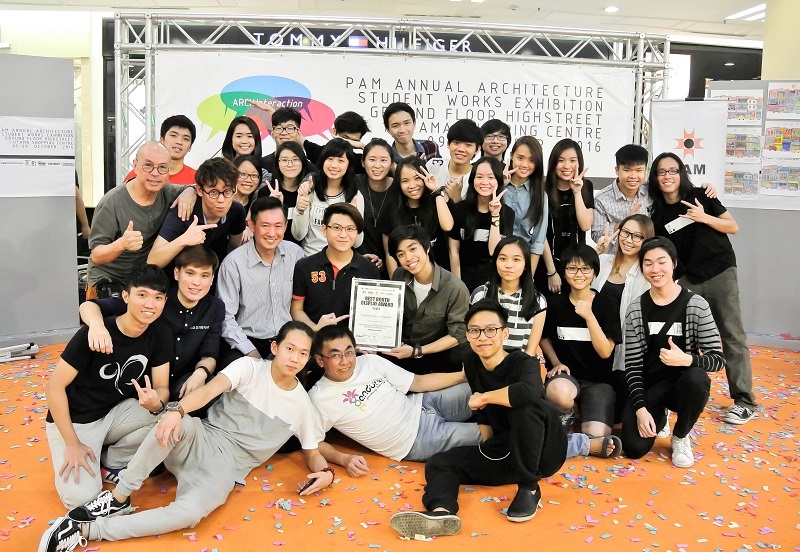 A team of 38 Architecture students from Studio One, Two and Three of the Department of Architecture & Sustainable Design (DASD) took home Silver in the Best Display Booth Award for their pavilion design titled “Coming Together” at the 11th Malaysian Institute of Architects (PAM) Annual Architecture Student Works Exhibition 2016 held at 1Utama Shopping Centre, Petaling Jaya from 5 to 9 October 2016. Themed ‘ARCHInteraction’, the exhibition aimed to showcase students’ best architectural works from all of Malaysia’s public and private institutions. Under one of PAM’s guidelines, each participating institution was required to exhibit their designs according to the theme and specification of being within 2-meter in width by 2-meter in depth by 2-meter in height. “Our pavilion design is an interactive spherical system in three ascending curvilinear facades merging into a blobitecture. It also lights up momentarily when a person assumes a sedentary position on the customised chair,” said DASD Lecturer and Exhibition Advisor Tew Bun Teck. The structure was held together through wooden joints in the timber panels, such as dado and mitre joints, without the help of adhesives or fasteners such as nails and glue. The structure can also take multiple forms or be repurposed into domestic furniture such as a bookcase, wine rack or clothes rack. Based on the visitors’ interpretations, the pavilion was also dubbed a space station, a cocoon or a bird nest. Furthermore, remnants from timber flooring were used to make bracelets and necklaces as well as interactive board games such as Tic-tac-toe. Hence, the pavilion aptly served its purpose as an interactive architectural development thematically. “The team proved themselves to be very effective and efficient in managing this project, a skill that is very important for architects,” Tew said. “From the perspective of design, the overall model could be better with more precise calculations of the joint angles, as well as replacing some of the erroneously cut panels since we still have many left over,” said Studio One Leader Chen Bing Wei. 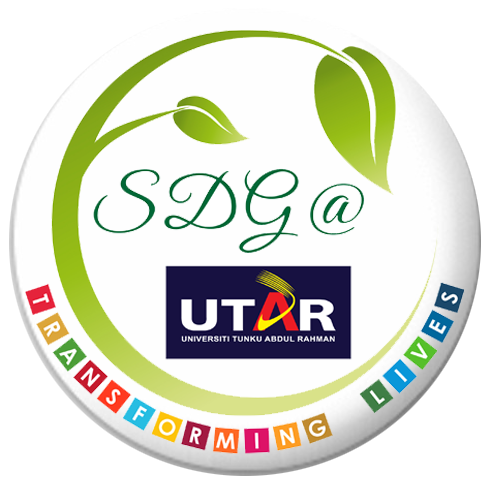 “This experience will definitely come in handy in the future. I’ve learnt how to communicate better and better manage my time, and made friends that could enhance my future career,” said Studio Two Leader Yap Chi Wen. Besides Chen and Yap, the 38 student team also consisted of Bong Jie Si, William Chen Sin Khoon, Cheng Hui Wen, Chuah Li San, Dorcas Lee Xian, Foo Yee Ping, Liew Yu Qian, Lucas Peh Zi Fong, Oh Xiao Li, Phoon Yi Kit, Shaun Tan Yong Kiat, Siew Kin Chung, Tan Xuan Xiang, Tan Zheng How, Teoh Huoy Shwu, Wong Chuan Seng, Wong Shi Weei and Yap Wei Hung, from Studio One; Ananrajs a/l Selvam, Chen Lit Ying, Chin Cheng Yue, Goh Suk Vei, Heng Vee Yi, Hor Yan Qi, Jonathan Tiong Khoong Ming, Koay Eugene, Evans Khor Yan Chun, Law Tze Yong, Lee Kai Yuan, Looi Chia Wei, Martin Lu Zhi Yie, Samantha Teo Yee Hui, Sue Ann Wee Tze Li, Steve Ting Kee Ping and Wee Zhi Shan, from Studio Two; as well as Chin Hongrui from Studio Three.